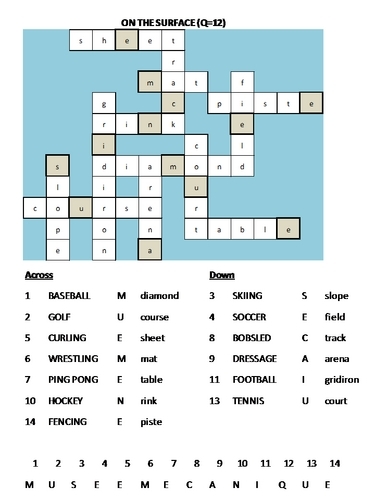 For each sport listed, players must fill in the name of the surface on which each sport is played. Each surface has one boldly outlined box on the crossword grid. Take each of those letters, and place them in order, according to the number next to the sport (refer to the solution below). You’ll notice that 12 is missing. The phrase in parentheses at the top of the clue hints that Q is the 12th letter. Put all the letters in order and you get Musee Mecanique, at Pier 45 near Fisherman's Wharf.